NEW YORK--(BUSINESS WIRE)--Social influencers increasingly have greater impact on consumer brand awareness and purchase considerations, as 31 percent of consumers across the U.S. and Europe said they have purchased a product or service based on a social influencer post. This finding came from the new “Psychology of Following” survey, commissioned by Olapic and conducted by CITE Research. The survey polled 4,000 active social media consumers ages 16-61, across the U.S., U.K., France and Germany, to better understand the psychology behind why consumers follow, listen to and trust social media influencers and how they act on those recommendations. Results of the “Psychology of Following” study uncovered a variety of interesting insights around following behavior, important attributes of an influencer and preferred platforms. German respondents had a higher threshold, with 34 percent of respondents suggesting an influencer has 50,000 or more followers. 31 percent said they use more ads in their posts. Authenticity is the most important factor when it comes to following influencers and trusting their endorsements. 39 percent said the expertise of the influencer would make them trust the endorsement. According to the survey, Images and video content are the most preferred types of influencer content while Facebook, Instagram and YouTube were the most favored platforms for following influencers. However, 35 percent of 19-24 year-olds listed still images in a feed as their preferred content. Followers primarily turn to visual platforms like Instagram and Snapchat to find influencers in Beauty, Fashion and Lifestyle. Lifestyle segment followers said that inspirational content (24 percent) and authenticity of content (23 percent) were the most important factors in determining influencers within this market. Social influencers are increasingly prompting consumers to consider purchasing a product or service, particularly in the U.S. and U.K.
24 percent said they have recommended a product or service based on an influencer post. For information about Olapic, or to request more information or view an infographic about the “Psychology of Following” report, visit: www.olapic.com. Olapic is an innovator in visual content solutions for user-generated, influencer-generated, and brand-generated visual content. Through a unique combination of technology, content, and expertise, Olapic enables brands to generate, curate, enhance, and distribute authentic, brand-relevant visual content across the entire customer journey driving brand engagement and performance, at scale, for hundreds of the world’s top brands. An official member of Facebook Marketing Partner program, Instagram Partner program and Pinterest Partners, Olapic is headquartered in New York City with offices in Berlin, Córdoba, Hong Kong, London, Los Angeles, Paris, and Tokyo. For more information on Olapic, visit www.olapic.com. Olapic is a wholly-owned subsidiary of Monotype Imaging Holdings, Inc. (Nasdaq: TYPE). 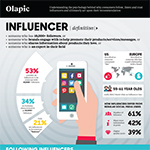 Olapic’s New “Psychology of Following” Report Details How Consumers Define Influencers, Why They Follow and How They Act on Recommendations.